The record is made up of 1 file (142 folios). It was created in 22 Apr 1936-25 Jan 1941. It was written in English. The original is part of the British Library: India Office The department of the British Government to which the Government of India reported between 1858 and 1947. The successor to the Court of Directors. Records and Private Papers. Correspondence regarding contracts to supply the Afghan Government with ammunition. The Government of India had agreed to supply 2.5 million rounds a year for six years, and the file primarily concerns negotiations between the Afghan Government and Imperial Chemical Industries Limited, over the supply of further ammunition. The majority of the correspondence is between Imperial Chemical Industries Limited and the Foreign Office, regarding the quantities of ammunition to be supplied, and price and payment options. The file also contains communications received by the India Office The department of the British Government to which the Government of India reported between 1858 and 1947. The successor to the Court of Directors. from the British Legation in Kabul (William Kerr Fraser-Tytler), reporting on meetings with the Afghan Prime Minister and War Minister, and commenting on the Afghan Government's arms-supply arrangements and negotiations with arms firms in Belgium and Czechoslovakia. 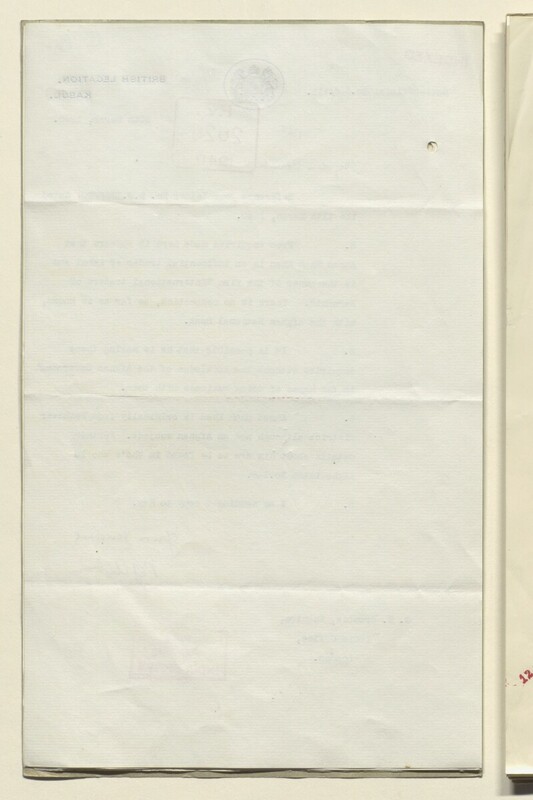 The file also contains a small amount of correspondence (dated 1941) between the India Office The department of the British Government to which the Government of India reported between 1858 and 1947. The successor to the Court of Directors. , the Government of India External Affairs Department, and the Department of Overseas Trade, regarding a request made by the firm International Traders of Karachi for permission to import British radios into India and Afghanistan. The file includes a divider which gives a list of correspondence references contained in the file by year. This is placed at the end of the correspondence (folio 2). The papers are arranged in rough chronological order from the rear to the front of the file. Foliation: the foliation sequence commences at the inside front cover with 1, and terminates at the last folio with 143; these numbers are written in pencil, are circled, and are located in the top right corner of the recto The front of a sheet of paper or leaf, often abbreviated to 'r'. side of each folio.